Turn SPL to JPG raster images online and without registration! Run the SPL to JPG Online Converter now or take a Coolutils batch App! 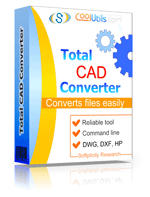 Get Total CAD Converter to convert your drawings safely. Get more accurate results with the more poweful engine. Total CAD Converter supports dxf, dwg, dwf, dwfx, plt, hg, hgl, hpg, plo, hp, hpl, hpgl, hp1, hp2, hpgl2, gl2, spl, svg, cgm files. Along with conversions you can rotate your CAD files! All is done in batch so you save a lot of your valuable time. With Total CAD Converter you can also resize your CAD drawings. Total CAD Converter can turn color drawings to black-and-white. Sometimes yellow lines aren't clear enough unless you turn them grey. Combine several CAD files into one multi-page TIFF or PDF file. When you convert several folders, the program can combine the output files of each folder. I.e. you convert 2 folders with 5 DWG files in each to TIFF. You get 2 TIFF files. If you want to convert CAD files on your server, apply for the server version. It is licensed per server. When you convert CAD to JPEG you can define the quality and smoothing for the resulting image. Convert DWG, DXF, SVG, and many other files in seconds via our clear wizard-mode interface. The widest list of output file types: PDF, TIFF, JPEG, BMP, WMF, PNG, DXF, BMP, CGM, HPGL, SVG, PS, and SWF! Total CAD Converter allows selecting compression mode, image DPI, photometric interpretaion for output TIFF images. The built-in Preview panel helps you to find the file you need faster. Add text watermarks to the header or the footer of the output file to prevent unauthorized use or add your copyright info. Want more order? Add page counters or a date to every page of the output files. When you convert DXF or DWG to PDF you can set user permissions, password-protect your files or sign them with your digital signature. Both PDF and PDF/A files are available. Use it as a powerful but affordable DWG converter. Batch convert files from and to DWG for easy sharing or importing to other Autocad apps. Try the Total CAD ConverterX (SDK) to use it in your ASP or PHP application with ActiveX. Total CAD Converter has full command line support (get the ready-to-use command line from GUI).